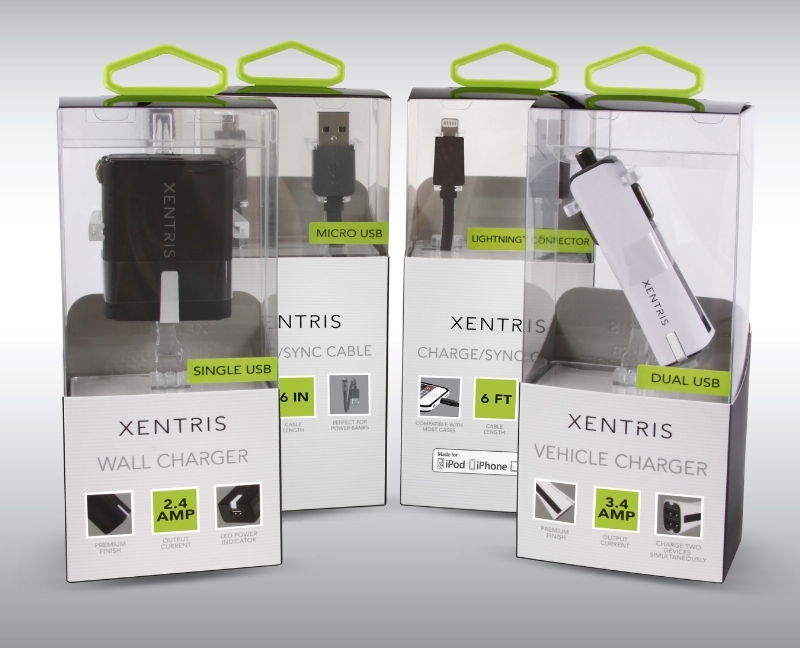 Xentris Wall and Vehicle Chargers are made of premium materials and finishes. Xentris Charge/Sync Cables are available with a Micro USB connector or Lightning(TM) connector. Xentris Wireless, a leader in designing, manufacturing and distributing high quality, innovative wireless accessories, features a line of premium power products for mobile devices during the CTIA Mobility Show 2015, an industry show that represents the newest mobile innovations for business, home, networks, retail, health, auto, media and money. 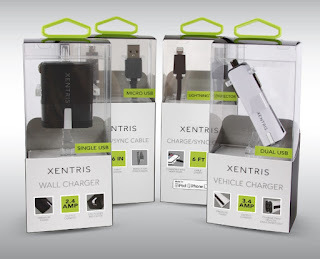 The Xentris line of premium power products includes chargers, charge/sync USB cables with a micro USB connector and charge/sync cables with a Lightning™ connector. The Xentris Chargers are sleek and compact. Made of premium materials and finishes, they have a soft touch finish and gunmetal contacts. The universal USB ports include Auto Detect IC Technology for improved compatibility with many consumer electronic devices. The indicator light on the front shows the charger is ready to power your device. The Xentris 2.4A Wall Charger features one USB port. The Xentris Vehicle Chargers are available in various charging amperages so you can select one that fits your power needs to rapidly charge your devices. Chargers with single and dual USB ports are available to charge one device or one tablet or a combination of devices. They are available in black and white. The Xentris Charge/Sync Cables allow simultaneous charging and data transfer. Charge your device from a standard computer USB port or use a wall or vehicle charger that has a USB port. The slim connector was designed to easily fit into your mobile device even when using a case, including most waterproof and rugged cases. The Xentris Charge/Sync Cables with Micro USB Connector features a push button LED light for easy connection in dim or dark environments. The Xentris Charge/Sync Cables with Lightning Connector are Apple certified. Both types of cables are available in a 4-foot tangle-free flat design in black, white and gray, a 6-foot stylish braided cable design in black and beige and a gray 6-inch flat cable which is an ideal size for power banks and charging your device from a standard computer USB port. To view the full line of Xentris products, visit http://www.xentriswireless.com/. About Xentris Wireless | www.xentriswireless.com Xentris Wireless is a leader in designing, manufacturing and distributing high quality, innovative wireless accessories supplying a full line of products to a wide range of customers and top wireless companies – including wireless carriers, retailers and dealer agents. With more than 24 years of experience, Xentris Wireless continues to provide exceptional product, sales, logistics and marketing solutions to the ever-changing wireless industry with proven success and continued commitment. 0 comments on "Xentris Wireless Launches Xentris Premium Power Products"